Hannah Addario-Berry. Photo by Jim Block. Hannah Addario-Berry is a Bay Area cellist who, if you’ve been to at least a few concerts this season, you have probably seen play at least once. 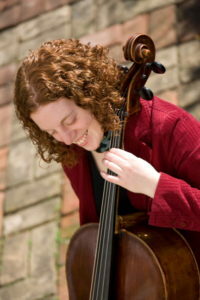 When she’s not curating her own unique, locally-minded concert series such as Cello Bazaar and Locaphonic, she’s playing with groups like the Zoco Ensemble, San Francisco Chamber Orchestra, Del Sol String Quartet, and more. I had the pleasure of sitting down with Hannah and discussing a few of her recent projects, her career advice to young musicians, and the ways in which the Center for New Music has become a nurturing presence in the Bay Area. I first heard about you in regard to a project called Cello Bazaar. How did this series come about? 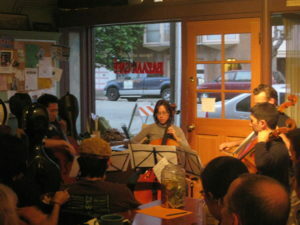 Cello Bazaar has been going on for six years at Bazaar Cafe [on 22nd and California]. I started it because I wanted to have an opportunity to improvise publicly, and was terrified to do so. So I signed up with a friend to play their open mic night. Before the show, my friend went and scratched his name off the list, so I figured I would try it out myself. I shut my eyes and played for ten minutes. Afterward, the owner came up to me and said they loved it, asked if I knew any other cellists, and offered me the opportunity to curate a regular cello night. From there it just took off—for the first four years or so I was doing it pretty religiously, nearly every month. The last couple years, because I’ve added a few more projects to my roster, I’ve sort of backed away a little bit and it’s started to have a life of its own. People know about it. I can mention Cello Bazaar and people say “Oh, I’ve heard of that!” It’s nice to have a project grow legs. Cello Bazaar. Pictured: Jerry Liu, Erin Wang, Sam Bass, Samsun Van Loon. Photo by Hannah Addario-Berry. Especially since it’s a project that’s a staple of one location. Yes—it’s nice because unlike some of the other projects I coordinate, it doesn’t take a lot of planning—it’s just a matter of finding out who wants to play each month. It’s pretty self-sufficient. And moreover, people love it—I mean, who doesn’t love cello? There are so many people whose favorite instrument is cello. They think it’s the sexiest instrument: you hold it between your legs, and it’s got this rich, human-like sound. Is the music still mainly improvised, some six years later? No. It’s grown to be a total blend. We’ve had Bach cello suites, jazz, improvised, songs and beatboxing, baroque cellists and viola da gamba players – the whole gamut. It was through doing Cello Bazaar I discovered my love for presenting, and my love for acting as a matchmaker between audience and performers. There’s something so exciting about putting great musicians in front of a receptive audience and just watching the expressions on their faces – watching the audience receive and enjoy the music, see their eyes light up and see the connections forming. People that have come to Cello Bazaar have become regular fans of some of the performers there. So you’re building these relationships. I admire how multi-faceted your musical life is. How did this come about? I was classically trained on cello and thought for a long time that I was going to have a very traditional classical music career (whatever that means)—and I knew that I loved playing chamber music, and gradually found out that I love playing contemporary music, but I still never really thought that I was going to have such a multifaceted career doing presenting and collaborating in all these different forms. Over time, I suppose I realized that I don’t have to be the one on stage to get great joy out of bringing music to people. I want to be on stage a lot, but I don’t want to be there all the time. And there are so many other people who are artists I believe in who might not get in front of an audience if I didn’t help them to do so. So that’s part of my personal mission as well. It seems like you are focusing in on some of the more important—and often overlooked—hats a musician needs to wear these days, particularly that of the curator and presenter. Absolutely. And I think that this is starting to pick up in music schools, where they are teaching some of those skills. But it’s slow, and it’s something that most of us had to teach ourselves when we came out of school. So I guess another part of my personal mission is to help younger musicians to develop those skills—the non-performance skills—and realize how active and self-motivated one has to be to have a vibrant career. Could you offer a few bullet points of advice for musicians who are fresh out of school, horrified, and looking to creatively jump-start their career? It goes without saying, I assume, that all these people are able to play their instruments exquisitely. The top point: Relationships. Build relationships, stay in touch with people, and don’t be afraid to reach out. If there’s somebody you admire, go talk to them. And never be afraid to ask for help. I think most people who are established in any field really cherish the opportunity to support people who are entering that field. A lot of the leads that I have in my current career come from relationships that I have nurtured from long ago. They think of me, they refer students to me, they offer gigs to me that they can’t do themselves. That kind of relationship building is priceless, more so than sending out resumes or doing competitions or cold calls. That being said, I wouldn’t say cold calls—that is, reaching out to somebody that you have no link with—are necessarily a bad thing. When I make cold calls, if my intention is to simply reach out and make the first contact, then I’ve succeeded. If my goal is to get them to respond to me, then I have no control over whether or not I succeed. I have a much higher success rate if I have a realistic goal—if their response is not a part of it. And then it’s a bonus if I get a response! Think of your colleagues as potential collaborators or resources, not competitors. And one more thing—it’s a cliché, but think outside the box. If you can, find connection between all aspects of life, all aspects of community, of expression—and for me it just happens that cello was my main medium. But it’s not exclusive of anything else, and in fact being able to pair what you do well with something else can be really great. You’re exploring this idea of pairing things with music in your recent projects too, right? Locaphonic collaborators Ryan Moskal, Annie Somerville, Hannah Addario-Berry. Photo by Tara Luz Stephens. Yes. The biggest project I’ve founded recently is the Locaphonic food and music series. The big idea is that food and music are so inherently beautiful together—they’re both means of expression, of nurturance. They are also things that when we receive them in a public way, such as music in a concert hall or food in a restaurant, you only see the final product. You don’t see the creative process that goes into producing a concert: the rehearsal process, the choice of repertoire, the curatorial side. Same thing with a dish: you see it on a menu, you order it, and you don’t see what farm the veggies came from, you don’t see what the chef was choosing from at the farmer’s market that morning, you don’t see how they decided to pair ingredients or what’s in season. So those creative processes are actually very similar—crafting a menu, crafting a concert program or piece. So that’s what I look at in putting food and music together: how can we bring that creative process into it, so that the audience is not just receiving the final product, but actually learning something about what brings food to their table and what brings music to their ears. A lot of this is through talk: the chef will come out and talk about their dish and their inspiration. Say, it’s May right now and so asparagus is in season, so we’re doing this. The musicians will talk in between their pieces. The dialogue, between dish and sound, artist and community, is what it’s all about. This aspect of community also seems to be an important part of your projects. Yes. 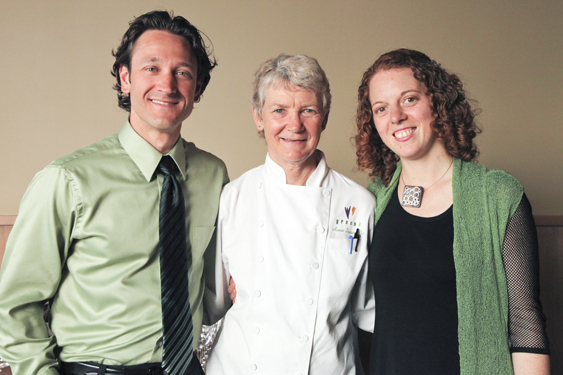 The Bay Area largely understands that supporting things that are local builds a strong community. But, having lived here my whole life, I felt I wasn’t witnessing as much of a “listen local” value as I was an “eat local” or “shop local” value. So at our event we will have communal-style tables, where people will sit together, share food and discuss the music. I know a lot of people who have met at Locaphonic events. So that’s of course really nice—again, opening that sort of dialogue. It also seems to reflect your own philosophy as an artist, this kind of community-oriented openness, this mingling and cross-pollination of ideas. Totally. It’s not a single-stream of music, practice, performed, received by audience – it’s not linear like this. How has the Center for New Music in particular been useful to you and your musical life? I was super excited when I heard about the Center opening up. I’ve known the guys putting this place together for a long time, and so I probably heard about it a while before they started putting the official word out. To see it come to life, gradually fill up and come together in such a big way has been really beautiful. I spend a lot of time here wearing various hats—in my own presenting projects, to collaborate with colleagues, and as a staff member of the [San Francisco] Friends of Chamber Music, who just moved into the space. I’m really excited to have that kind of work be in this space and to share resources with other fiscally sponsored projects. I think it will be really valuable to have everyone meeting here in one space, sharing ideas and having a think tank that is very supportive. I came in here once to put the final touches on a grant application, and was having trouble with a particular paragraph. Adam [Fong] was working next to me, and I asked him to take a look at it. He took a look and said, “well, when I was on the panel for this grant…”—so there you go. That’s the essence of this kind of place. Different kinds of people with different expertise, in different areas. It’s so valuable. What’s an upcoming event in the Bay Area that you are especially excited about? San Francisco Music Day is happening on October 20th at 50 Oak Street [the San Francisco Conservatory of Music]. It’s presented by the [SF] Friends of Chamber Music and will consist of thirty different ensembles focusing on the music of Latin America. Earlier we were talking about cross-pollination—to be able to go to one venue and hear all these different groups play everything from jazz to world music, early music to contemporary music—to have someone come to hear a string quartet but wander into a new space and be exposed to an entirely new stream of music—is fantastic. And it’s completely free! We will also have some food trucks from Off the Grid, so you’ll get a nice food and music pairing as well. Lovely piece, and Hannah is the bomb. Whenever I spot her in an ensemble onstage, I know it’s probably going to be a very good performance.